The King’s Audience Hall in Hampi, as the name indicates, is a building that was meant for the use of the King of Vijayanagara. The building is located within the Royal Enclosure in Hampi. It is a ruined structure whose remnants can be spotted on the western side of the Mahanavami Dibba. The building is believed to have been one of the imposing structures in Hampi that was fit for the use of the mighty Kings of Vijayanagara. It was the building that served as the King’s Court. The ruins of the King’s Audience Hall attract visitors even today. The King’s Audience Hall was built during the time of the Vijayanagara Empire. It was the building where the king used to meet his subjects and address their grievances. The building is also known as the Durbar Hall of the King of Vijayanagara. According to the famous historian Abdur Razzak, who visited Vijayanagara during the reign of Devaraya II, the King’s Audience Hall was one of the most magnificent buildings in Hampi during that time. It is believed that several noblemen used to attend the court of the King of Vijayanagara held at the Durbar Hall. These noblemen used to come from near as well as far off places. A long stone tough built outside the premises of the Durbar Hall indicates that it was used for storing drinking water for the horses of the noblemen who came to attend the King’s court. The King’s Audience Hall is a structure whose remnants indicate that it was a huge building. The ruined structure of the building has vestiges of pillar sockets and bases. An interesting fact to note is that it was a hall with a hundred pillars, as is proved by the number of pillar sockets. As such, it is sometimes also referred to as the 100 Pillared Hall. The sockets of the 100 pillars are arranged in an array of 10 x 10 on a platform of the building. These are the remnants of the pillars that had once supported the superstructure of the building. The King’s Audience Hall was built with huge blocks of stone and wood. The structure has a ruined stone stairway at the rear of the hall that suggests it might have been a two storied building. It is believed that the superstructure of the building was mostly made of wood and the pillars were carved out of sandalwood trees. This is the reason cited by many experts behind the complete destruction of the superstructure. It is believed that the building was destroyed by fire during the raid by the Mughal attackers in 1565 A.D. The remnants of the hall provide traces of the carvings and architecture that had once decorated the whole structure. The King’s Audience Hall has the ruins of high platforms from where the surrounding areas of the building can be seen even today. This means, during its peak days, the building provided a fine view of the other structures that existed within the Royal Enclosure. The front of the King’s Audience Hall is a large paved and enclosed area that leads to the Mahanavami Dibba. 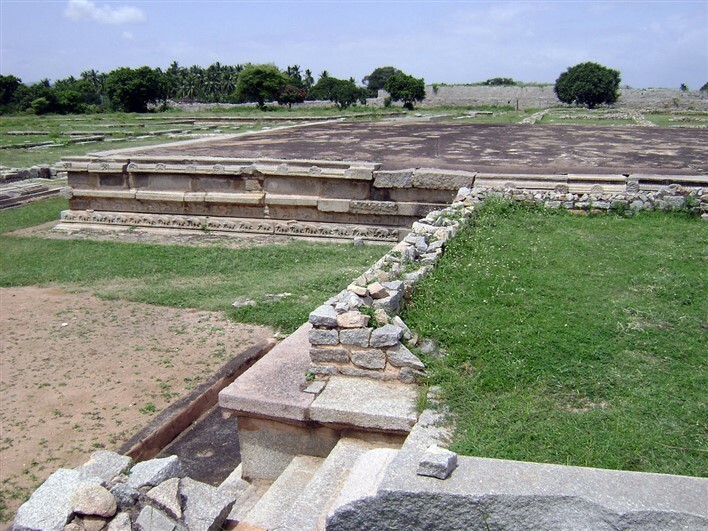 This was the area where several public festivities used to take place during the peak days of the Vijayanagara Empire. The King’s Audience Hall in Hampi is one of those structures that have succumbed to the destructive forces of man and nature. The superstructure of the building has ceased to exist for many centuries now. All that remains is the base and some ruined platforms and stairways that were part of the grand building. However, the remnants of the building attract visitors even today, more than 500 years after it was destroyed. The ruins remind people of the grandeur and magnificence that have been lost forever. The remnants of the King’s Audience Hall are one of the several attractions of the Royal Enclosure in Hampi. The Royal Enclosure can be easily accessed by vehicle from almost all parts of Hampi. Since the enclosure has remnants of many other structures belonging to the period of the Vijayanagara Empire, it is better to keep some time in hand while visiting this fortified area and the King’s Audience Hall. Though Hampi is popular tourist destination, it cannot be reached directly by flight as it has no airport of its own. The closest town to have an airport is Ballari (Bellary) and it is located at a distance of about 64 km from Hampi. Visitors can reach Ballari by flight and proceed to Hampi by means of local transport. Hampi cannot be accessed directly by the train route as no railway station exists in the ruined town. The nearest railway station is located in the town of Hosapete (Hospet). It has the Hospet Junction Railway Station. The town of Hosapete stands at a distance of just 10 km from Hampi. One can easily take a bus or avail other means of local transport to reach Hampi from Hosapete. One of the simple ways to reach Hampi is to travel by road. Hampi has a good road network and is well connected to many towns and cities of Karnataka by means of the road network. There are several buses that operate between Hampi and many of the major towns and cities in Karnataka. Visitors can hire private cars or other vehicles from Bengaluru (Bangalore) or Mysuru (Mysore).